Westward the Light is a remarkable new band – a collaboration between piano/fiddle duo Charlie Grey and Joseph Peach (BBC Radio 2 Young Folk Award finalists 2017), fiddle/viola player Sally Simpson (Catriona Hawksworth and Sally Simpson, Heisk) and guitarist/vocalist Owen Sinclair (Tanara, Inyal). 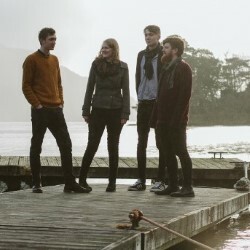 On fiddle, viola, vocals, piano and guitar, this enormously talented young quartet creates a sound reflective of upbringings immersed in the nature and landscapes of Scotland. Elements of melodies are highlighted and explored by a varied instrumentation. Audiences will be taken on an aural journey of Scottish sentiment, weather, culture and modernity.